Kalaeloa Airport is located just 8 nautical miles from the Honolulu International Airport. Luxury and upscale accommodations are located on Oahu’s west side less than 4 miles driving distance from the airport. If staying in Waikiki, the airport is just 1 mile away from the H1 freeway and a 25 to 35 minute drive to Downtown and to Waikiki. 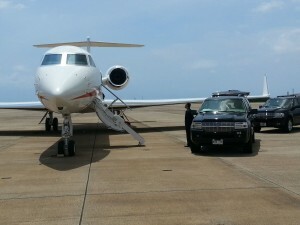 Plane-side crew and VIP transportation provided by award-winning Platinum Limousine with 24 hour service upon request. These floral garlands were worn by early Hawaiian natives to distinguish themselves from others. Beautiful, fresh leis are a great way to start a vacation in the islands. At one time, the lei was given wrapped in ti leaf or other native foliage and presented to commoners or people of importance. However, the lei was never placed over the head of another because the head was considered sacred. When presenting leis to royalty, it would customarily be presented to a close representative, and never to them directly. Barbers Point Aviation Services currently offers a comfortable receiving area for airline crews needing to conduct flight planning. Our office is small but is convenient and accommodating.